I’m Tamara and I split a ‘just veggie’ and an ‘empire’ share -which comes to the same thing as a Vegan’s Deluxe ,which in my mind I’ve been calling a vegan’s delight – with my boyfriend and our 17th month old son Meshak. We aren’t strictly vegans but we eat a plant based diet 6 days a week and cook most of our meals at home. We try to keep at least part of every meal raw. Usually that means we are experimenting with ‘salad’. Over the past year, we have been converting to a completely organic diet (having a kid will do that to you). It’s a process. An important part of that was joining Southside CSA this year and we are super excited about what’s to come. 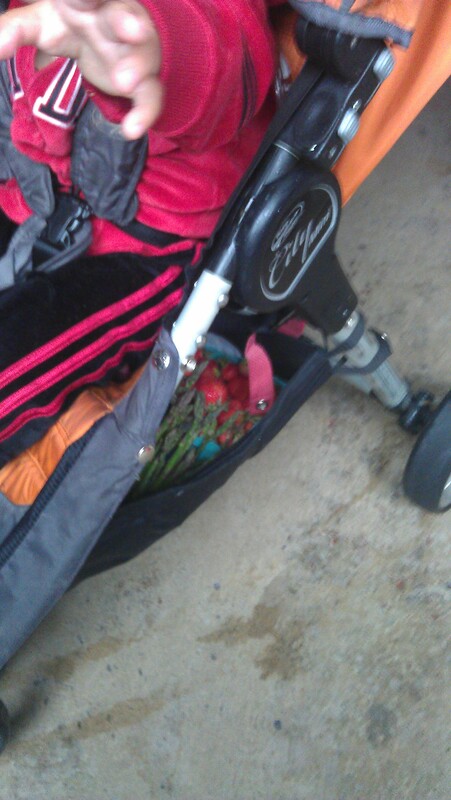 …both of which were easily carried home on the bottom of Meshak’s stroller.